The UK astronomy and geophysics community is larger than ever, according to the results of the latest demographic survey from the Royal Astronomical Society (RAS), published in the December issue of Astronomy & Geophysics, the RAS in-house journal. But it remains overwhelmingly white, there is only a slow improvement in the proportion of women, and disabled people are starkly under-represented. As the UK approaches Brexit, the new work also notes that 1 in 3 postdoctoral researchers are from elsewhere in the European Union. In the autumn of 2016 RAS staff worked with Dr. Sean McWhinnie of Oxford Research and Policy in a major survey of individual researchers and UK research groups in universities and research establishments. With 903 individual responses, and data from 87 departments, this is the largest survey of its kind, and provides a benchmark for the work of the Society, as well as tracking changes since the previous survey in 2010. The equivalent of more than 1400 staff now work in UK astronomy, a similar number work in solid-Earth geophysics (the survey now includes some in organisations like the Met Office), and over 250 work in solar system science. 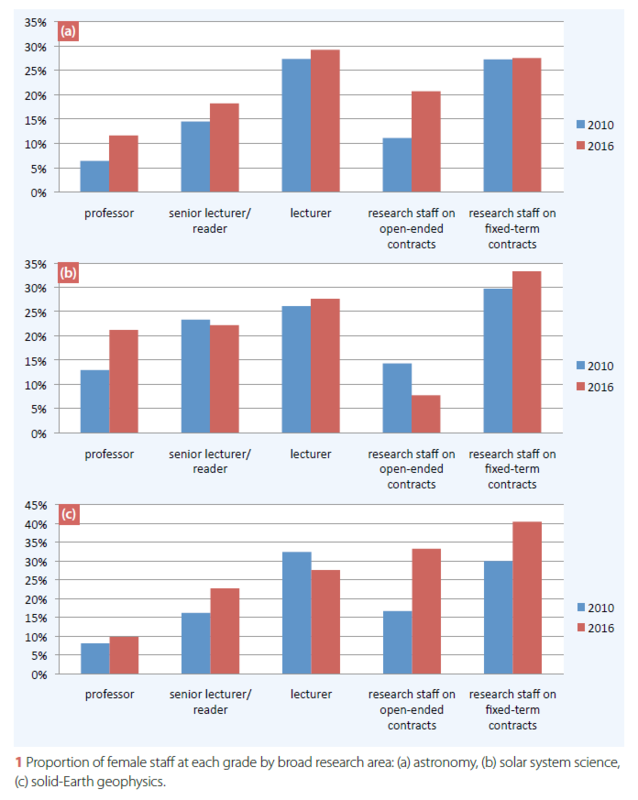 In astronomy and solar system science, this represents an increase of 23% since 2010, and within that cohort, 20% now hold professorial posts. More women work in astronomy and geophysics than in 2010, and in general the proportion of female staff has risen at all levels, though the ‘leaky pipeline’ persists: the fraction of women declines with seniority. Women make up more than a quarter of lecturers and fixed-term researchers in astronomy and two-fifths hold the same roles in solid-Earth geophysics. In contrast, at professorial level, women comprise 12% of those working in astronomy (up from 6% in 2010), 21% of those in solar system science (13% in 2010), and 10% of those in solid-Earth geophysics (8% in 2010). RAS scientists from the UK are significantly less likely to be from minority ethnic backgrounds than the population at large. In the most recent census, 87% of the population described themselves as white, compared with 95% of permanent staff and 97% of fixed-term researchers. At postgraduate level, the data are more encouraging, with 87% of this cohort identifying as white. Although the sample is too small to draw firm conclusions on representation of people from different ethnic groups, the authors note that just one UK respondent (a PhD student) identified as black. 52% of respondents originated from outside the UK. Within this group, researchers from other EU countries were the largest group, making up almost 1 in 5 permanent staff, 1 in 3 postdocs, and 1 in 6 postgraduate students. A striking result from the survey is the absence of disabled adults in the astronomy and geophysics workforce. Just 2% of respondents consider themselves disabled, compared with 16% of working age adults in general. At undergraduate level, UCAS data suggest that 7-10% of astronomy and geophysics students (excluding those on more general natural science courses) are disabled. This finding suggests woefully low recruitment of disabled adults into academic posts. The full survey also includes data on research activity, sources of funding, family size, and the career intentions and movements of researchers. These will be the subject of a second paper in 2018. Proportion of female staff at each grade by broad research area: (a) astronomy, (b) solar system science, (c) solid-Earth geophysics. Nationality of: (a) permanent staff, (b) postdoc research associates, (c) postgraduate students.